For some graduating students there is a rush to get out of the confines of academia and into the working world. For others there is an element of uncertainty and apprehension. College was a place where you were your own boss and the thought of being forced into the rat race is abhorrent. While the world has always been an uncertain place, there is a strong argument that it is more uncertain than it has been in recent decades, especially for college graduates. It is no longer as simple as getting into a good college, getting good grades, graduating, getting a good job and settling down, even if that was what you wanted in the first place. The economy is uncertain, good jobs are harder to come by and the competition is fierce. We all want meaningful and rewarding work but at the same time you need to make sure you first have the ability to make a living. It may be that you have to take a menial job while you wait for your dream career. Unfortunately the uncertainty doesn’t end there. Once you are making some money you have to be able to protect it, as inflation, taxes and student loan repayments eat into your earnings. There is a very real fear that once you actually get a job you will feel like you can’t leave, chained to the paycheck that you need to pay your student loan and ever increasing living costs. By comparison the college lifestyle seems like a dream. You were essentially your own boss and while you had some hoops to jump through and requirements that you had to meet, how you went about doing all those things was up to you. The loss of freedom in moving to a 9 to 5 job, with a boss, can be a hard adjustment to make. While those fears are very natural and well-justified, the direction of your life is in our own hands. You can make decisions that will lead you down the path to a deadening soul, or you can make decisions that lead to freedom, flexibility and the rewarding career that you want. Life is what you make it, so while you should acknowledge the challenges and uncertainty, don’t let it weigh you down. Focus on the upside and you will benefit from the all the wonderful opportunities in the world. The world and the economy changing is only bad news in you are inflexible and unwilling to adapt. The last two or three decades have seen people abandon the notion that you should have one career for your whole working life. It is now perfectly normal to have three, four, five or more career changes throughout your working life. This is now changing again, where the idea of even having a traditional career in the first place is optional. Flexible work arrangements, digital nomads and freelancers with clients all over the world are going to become the new norm. Thanks to the Internet it is possible to avoid getting a “regular” job at all. It takes a lot of hard work and a bit of luck, but commuting online or starting an internet business is not a pipe dream, it is a legitimate and perfectly reasonable goal. The global economy is still adjusting to the emergence of half the world from communism. People in those countries are willing to work for very low wages compared to the West and this has resulted in a lot of business moving East and a shifting of wealth and power to Asia. 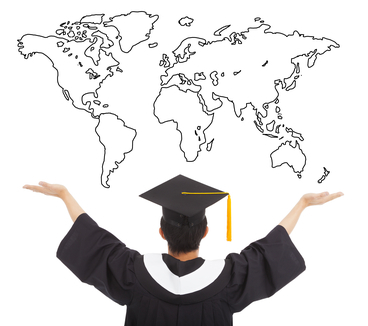 What this means for you, the new or soon to be new graduate, is that traditional opportunities may be limited to you in North America and Europe. But opportunities abound in China, Vietnam, India, Singapore, Malaysia and other countries. Developed Western economies located in the Asia Pacific region such as New Zealand and Australia are also well placed to benefit from this transition. If you are flexible, adaptable and willing to think outside the box then you can take advantage of these possibilities. There is also the opportunity of geo-arbitrage. This means earning money in more valuable Western currencies by working online, while living in an emerging economy, such as Thailand or Chile, where prices are cheap, your purchasing power is greater and therefore standard of living is higher. $1000 a month goes a long way in a place like that. While the college classroom is familiar and comforting you aren’t actually productive. You learn but you don’t create or do. The chance to actually be productive and do something in the world is very exciting and beats the monotonous drudgery of the classroom. Learning is important but human beings are designed to make, create and do. The thing that scares people is being stuck doing something you don’t like, working in a job you hate, for a boss that you don’t respect. This can happen for a period but eventually you will find something satisfying if you hustle hard enough. While it may be daunting and uncertain moving from college into the working world it can actually be very liberating. Doing something useful and contributing to a business or an organization is very satisfying and you can take pride in your paycheck, which is the reward for the value you have provided. The lack of structure in life can be challenging at first. When all your friends graduate and go off in different directions and move ahead in life at different speeds, it can be disconcerting. But the trade-off is that the freedom and possibilities and endless. Going to college ties you to a specific location for a number of years and limits the possibilities for income – this will no longer be your reality. It grated on me when people told me that the world was now my oyster, but looking back on it they were right all along. There have been some periods of employment where I have felt boxed in and enslaved, but they have always been temporary and voluntary. It has been easy to walk away and fly half way around the world for a new adventure. At the end of the day the only constant thing in life is change. You went through a big change moving from high school to college and you will go through a big change again moving from college to the working world. But it won’t be the 40 years chained to a desk that you fear. The world is an exciting place full of opportunities. Life inevitably goes on, so you might as well make the most of it.